Tan earned his title in part by developing a course at the search engine giant in meditation and “mindfulness” – what Dr. Jon Kabat-Zinn, founder of the Center for Mindfulness in Medicine, Health Care, and Society at the University of Massachusetts Medical School, describes as “paying attention in a particular way: on purpose, in the present moment, and non-judgmentally.” Tan’s seven-week class became so popular that there was a half-year long waiting list to get in. Tan went on to write the best-selling Search Inside Yourself: The Unexpected Path to Achieving Success, Happiness (and World Peace), before leaving Google to found a company of his own. His goal: to take the Google mindfulness-for-the-corporate-world approach on the road. 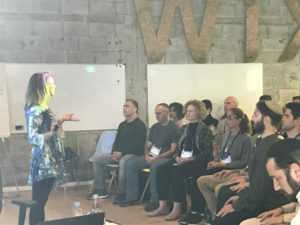 On two warm spring days in the Wix Business Hub at the picturesque Tel Aviv Port, 70 people paid upwards of $1,000 each to learn how adopting the principles of mindfulness can turn them into more productive and better engaged managers at work. As someone who has participated in half a dozen more traditional meditation retreats, I wanted to see whether Tan’s system could teach in two days what it usually takes a week (or a lifetime, really) to achieve. 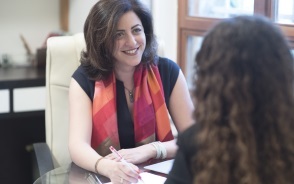 Search Inside Yourself (SIY) Tel Aviv was led by two enthusiastic facilitators who presented a kind of “Mindfulness Greatest Hits,” backed up by lots of scientific research and studies, all wrapped in the language of business. Everything you’d learn in a week-long retreat is there – sitting meditation, focusing on your breath, guided body scan, gratitude, mindful eating. But with time so limited and with most of the participants new to mindfulness, everything was compacted into short-attention span bites. So instead of a half hour silent sit, the instructors would give a 30-minute lecture, complete with PowerPoint slides, followed by a mere five-minute practice session. There were also activities that seemed more like something you’d learn in a self-help workshop – or maybe in a marriage counseling session. Like “mindful listening” (where one side talks for two minutes while the other says nothing). Or “mindful conversations” (where your partner adds a few key phrases at the end, like “What I heard you say was…” then the two sides switch). The traditional “loving kindness” practice, where you silently envision people to whom you want to beam good wishes, was transformed into a kind of couple’s exercise where you gaze into your partner’s eyes while channeling blessings. It’s effective but also unnervingly intimate, especially with someone you just met. I’m used to the custom practiced by many on meditation retreats where people avoid any eye contact whatsoever. All this points to perhaps the biggest distinction between SIY and a silent retreat – it’s not silent. Participants are encouraged to share their reactions with the group after each exercise. Lunch was burgers and networking. Phones are discouraged but not banned. Since attending the seminar, Garson says she has started integrating mindfulness into her consulting work. “It’s really helped empower some of my clients with business decisions they had to make,” she says. SIY is full of useful tips for business. If you’re triggered by someone at work and tempted to respond quickly, practice “SBNRR.” Stop. Breathe. Notice where you’re at. Reflect on what you really want to say. Then finally you can Respond. It works in person and for email, too. When you arrive at a business meeting, encourage everyone to do a one-minute “check-in” before jumping into the agenda. One doesn’t automatically shed the lingering effects of a difficult commute, a contentious previous meeting or a tricky project just because the door has closed and the room has been called to order. SIY has the potential to reach many more people than a traditional mindfulness program for another reason – and it’s a biggie: it’s the kind of seminar you can get your work to pay for – or bring in-house. SIY founder Chade-Meng Tan says the potential goes beyond just work. “I believe the skills offered here will help create greater peace and happiness in your life and the lives of those around you, and that peace and happiness can ultimately spread around the world,” he writes in his latest book, one of several self-help Search Inside Yourself titles. Two days of “searching inside yourself” in a business setting is an excellent way to start the process of honing that quality. I first compared mindfulness and meditation retreats at The Jerusalem Post. Next post: Is Judaism an operating system or an app?